Yes, I am a slacker blogger! Sorry! The garden did fabulous this winter. We changed a few things that we have done in the past and learned some things about the new microclimate in our yard. First off, we decided to keep the screen porch mostly free of plants this winter. It's usually cramped with salad greens, herbs, aloe vera and what ever else we are trying to save from the frost. This winter we only kept the parsley on the porch and that was mainly for easy access while cooking. We knew we had to go bigger this year with our garden of salad greens so DH added a 2x8 bed that we made into a mini greenhouse. using tomato cages topped with chicken wire, we built what DH affectionately called his "ghetto greenhouse." It was covered with a large plastic paint tarp from Ace Hardware. During the bone chilling (for us desert dwellers anyway) and very wet 3 week winter (LOL! )- the garden stayed warm and the greens thrived. We had several varieties of lettuce, swiss chard and broccoli. We also used the paint tarps to keep out potted herbs out of the frost. We pushed out outdoor tables together and tented them with the plastic tarps. A few bricks held the plastic down in the wind. All the potted plants stayed under the tables during the cold snap. Last year my neighbors on either side of me replaced the old wooden fencing with new brick walls. Since then the frost warnings have meant nothing to us. When the low temp is supposed to be in the mid 40's - I have a birdbath full of ice. We've had to be extra careful this winter to make sure everything was protected. We try and reuse and repurpose what we can. I saved some plastic containters from the trash at work. They are fairly large clear containers that caterers use to bring ice to the office during parties/meetings. They are very durable and as soon as I saw them I thought they would make terrific hot caps. We tried them out on some containers I found on clearence at Kmart (Main and Lindsey in Mesa, I love that place!). We are growing brocolli raab and so far - so good. DH and I both see lots of recipes in cookbooks that use brocolli raab but we couldn't even find it in stores. I've since learned that Sprouts carries it ($2.99 per lb -not!). Brocolli raab with our repurposed hot cap! The front garden was awesome on it's trial run and we will certainly be keeping it up. I was running around like crazy picking peppers and tomatoes before the frost and all for no reason at all. Although the lantana was killed last year by the frost - it did not touch anything it the front garden this winter. In fact- I still have flowers on the tomatoes. I'm going to let the current plants stay, just to see how they produce for a second season. Trial and error! 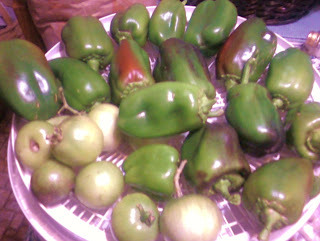 Peppers and tomatoes picked before the first frost. We let them ripen indoors. We had a few problems with hungry little birds when we let the peppers ripen on the vine so either way they would have been harvested early. They tasted great!